ANSI/ISEA Z308.1-2015 Class A First Aid Kits. Ensure laboratories, classrooms, and workplaces are up to date and compliant with these convenient Class A First Aid Kits. 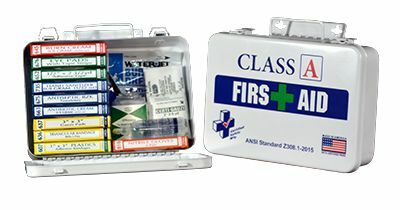 Each kit contains the necessary high-quality first aid materials to ensure that you meet OSHAs 1910.151 requirements to have first aid supplies readily available and ANSI Z308-1 minimum requirements for first aid. 16 Unit Kit includes: (16) 1 x 3" Plastic Certi-Strips; (3) 40 40 x 56" Triangular Bandages with Pins; (4) 3 x 3" Certi-Gauze Pads; (10) 1g Certi-Sporyn Antibiotic Cream; (10) 5 x 7" Antiseptic Towelettes; (10) 1g Hand Sanitizer; (2) 1/2 x 2 - 1/2 yd. Certi-Tape Rolls; (8) Eye Pads, 4 & Certi-Tape, 4; (10) 1g Certi-Burn Cream; (2) Large Nitrile Glove Pairs; (1) 5 x 5" CPRotector Plastic Bag; (1) 4 x 4" Water Jel Burn Dressing; (1) 5 x 7" Certi-Cool Junior Cold Pack; (1) 1oz. Eye Wash; (1) 2" x 6 yd. 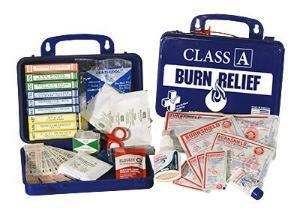 Certi-Gauze Roll; (1) 4" Bandage Scissors; (2) 5 x 9" Trauma Pad Compress; (1) First Aid Facts Guide Book. 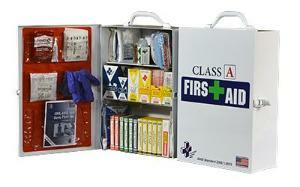 24 Unit Kit includes: (16) 1 x 3" Woven Certi-Strips; (16) 1 x 3" Plastic Certi-Strips; (2) 2" x 6 yd. Certi-Gauze Rolls; (3) 40 x 40 x 56" Triangular Bandages with Pins; (4) 3 x 3" Certi-Gauze Pads; (10) Woven Fingertip Certi-Strips; (8) Woven Knuckle Certi-Strips; (10) 1g Certi-Sporyn Antibiotic Cream; (10) 5 x 7" Antiseptic Towelettes; (10) 1g Hand Sanitizer; (8) Eye Pads, 4 & Certi-Tape, 4; (10) 1 x 2" Insect Sting Wipe-Ups; (10) 1g Certi-Burn Cream; (1) 36" Sam Splint; (1) 2" x 5 yd. Ace Style Elastic Bandage; (2) Large Nitrile Glove Pairs; (1) 1/2" x 5 yd. Certi-Tape; (1) 5 x 5" CPRotector Plastic Bag; (1) 4 x 4" Water Jel Burn Dressing; (1) 5 x 7" Certi-Cool Junior Cold Pack; (1) 1oz Eye Wash; (1) 4" Bandage Scissors; (1) 4" Plastic Forceps; (2) 5 x 9" Trauma Pad Compress; (1) First Aid Facts Guide Book. 75 Unit Kit includes: (50) 1 x 3" Plastic Certi-Strips; (6) 2 x 3" Plastic Certi-Strips; (10) 3 x 3" Certi-Gauze Pads; (4) 2 x 3" Certi-non-Stick Pads; (1) 2" x 5yd. Tan Certi-Rip Elastic Cohesive Bandage; (2) 2" x 6 yd. Certi-Gauze Roll; (1) 4" x 6 yd. Certi-yard Roll; (3) 40 x 40 x 56" Triangular Bandages with Pins; (2) 1/2" x 2 - 1/2 yd. Certi-Tape; (25) Woven Fingertip Certi-Strips; (25) Woven Knuckle Certi-Strips; (25) 1g Certi-Sporyn Antibiotic Cream; (25) 5 x 7" Antiseptic Towelettes; (1) HSB BloodBorne Pathogen Economy; (10) 1g Hand Sanitizer; (8) Eye Pads, 4 & Certi-Tape, 4; (10) 1 x 2" Insect Sting Wipe-Ups; (10) 1g Certi-Burn Cream; (2) Large Nitrile Glove Pairs; (1) 5 x 5" CPRotector Plastic Bag; (1) 4 x 4" Water Jel Burn Dressing; (1) 4 x 60" XL Certi-Stopper TD; (1) 5 x 7" erti-Cool Junior Cold Pack; (100) 3" Cotton Swabs; (1) 1oz. 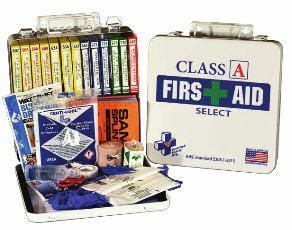 Eye Wash; (2) WoundSeal Tubes; (1) 5 x 9" Trauma Pad Compress; (1) First Aid Facts Guide Book.